I'm so excited to let you all know that Stampin' Up! is doing Deals of the Week for the month of October !!!! Even as a demonstrator, we won't know which item(s) will be the deal of the week until it is announced. During the month of October, Stampin' Up! will offer several discounted products as "Deals of the Week.
" No limits and no minimum purchase required". Deals are only available at their discounted price during the specified time. The are regular price the rest of the month. Deal # 1 .... Oct 1, 2009 12:01 AM (MT) ..... ends Monday, October 12, 2009 until 9:50 AM (MT). These special prices are only valid during this time frame. These items may be purchased at a workshop, by contacting me directly or by placing an order through my on-line website. I'm so excited about this promotion, I just know you are too. If you have any questions, please do not hesitate to ask. Can you guess what these are????? 1. 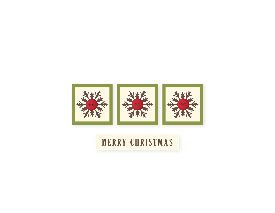 Made with Stampin' Up! 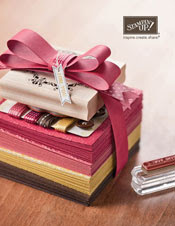 Products (ribbon, cardstock, punches, shimmer paint, stamp sets, roller wheels, brayer, speciality papers and much more). 3. Perfect for male or female. Any ideas ... please post your answer in the comment section. I will have a tutorial on them later this week. UPDATE/ANSWER (Friday Night - 10/2/2009): These are corner bookmarks. They are so easy to make and have been a big hit with everyone I have given them to. Can be decorated in so many ways for men, women, or children. I'm working on the tutorial right now and it will be posted by Sunday night. UPDATE (Saturday - 10/3/2009): I just posted the tutorial on how to make these, CLICK HERE to view. Seems impossible that 2010 is just 3 months away. The time goes by so quickly. 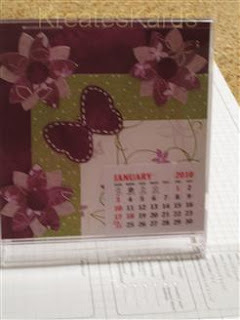 One of my customers (thanks Betty H.) told me about a calendar she had seen on-line that was displayed in a CD case. Well, I just had to research it for myself. I was so excited to learn how to make these, that I just had to share with all of you too. 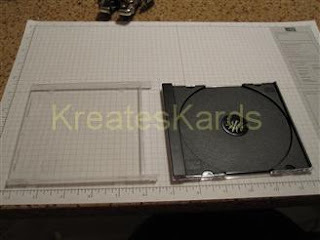 CD Case purchased at store -- needs to be clear and standard size, not slim line. Calendar - create on your computer or purchase. 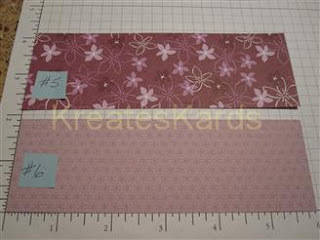 Size used here is 2 1/2" x 1 3/4"
#1 - Rich Razzleberry - 4 3/4" x 5"
#2 - Cottage Wall (micro dots side) - 4" x 3 3/4"
#3 - Cottage Wall (white with vines) - 3" x 2 3/4"
These papers are used the flowers. You will punch out 3 of each pattern to layer. 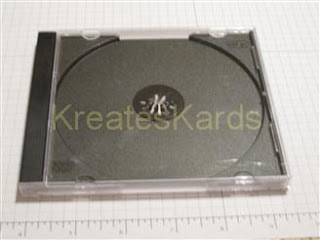 The CD case is clear with a black insert. It will hold one CD. Gently separate the lid from the base by individually pulling outward on each side. The black insert should be fairly easy to remove. It can be tossed (recycle if it has a code on it). Now you are going to assemble these to make a clear stand for your calendar. Flip the base so that the part that held the black insert is now facing downward. Gently doing one side at a time, attach the lid to the hinge area. The smooth area will be facing you and the inside with the tabs will be facing away. When complete the calendar will slide in between the clear area and the tabs. 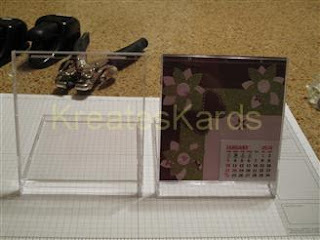 The clear front will protect your calendar from finger prints etc. When the stand is in place properly, you will not be able to close the case. It can go forward to lay totally flat, but will not go back. Here's an examples .... without a calendar in it and one with. 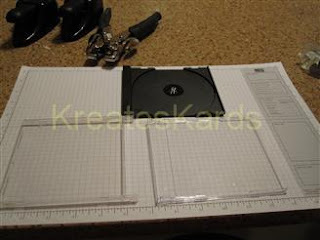 Be sure you test your #1 piece of card stock to be sure that it will glide smoothly into the CD holder. IMPORTANT: Be sure when you set the paper down that you are working with the height up and down. If you miss this step, your calendar will not fit properly in the holder to be displayed as shown above. Using SNAIL adhesive, attach White with Vine DSP piece (#3) to the micro dot DSP (#2). Using a couple pieces of sticky strip on the back of your calendar, attach calendar to the white with vine DSP #3. 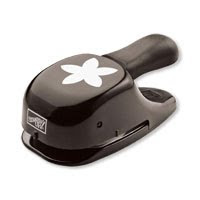 Using the 5 Petal Paper Punch, punch out 3 flowers from each piece of DSP (#5 & #6). Here are your 6 flowers. You are going to make 3 flowers. Each flower will have 2 layers (1 lighter, 1 darker) and will be attached together using SNAIL adhesive. 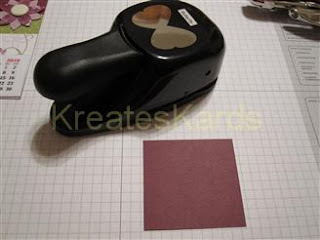 Using Rich Razzleberry (#4) piece of card stock, punch out one butterfly. Using the scraps from this piece, punch out three 1/2" circles to use as flower centers. Using SNAIL adhesive, attach the center to each flower. 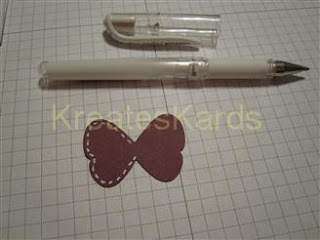 Using the Uni-Ball Signo Gel pen, outline your butterfly with little stitch type marks. 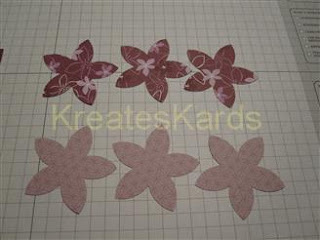 If you would like, you can also do the same stitch marks on the flower centers. Draw in the body of your butterfly using the Stampin' Up! Marker in Basic Black. I usually do a straight line, then a tiny circle with 2 tiny lines for the antennas. 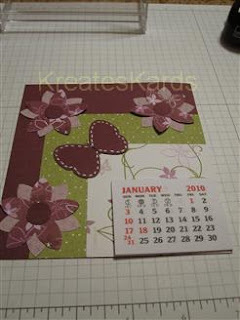 Determine the placement you would like of the flowers and the butterfly on your calendar. 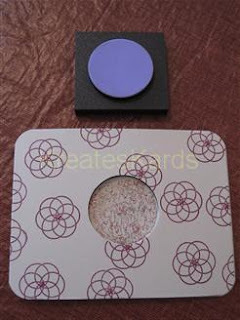 Be sure that the petals and/or the wings do not go over the edge of the large Rich Razzleberry card stock. Attach using SNAIL adhesive. Slide your calendar into the stand and you are all set. Use your imagination on all the different possibilities for this calendar. You could also design one page per month and store the other pages in a box until needed. 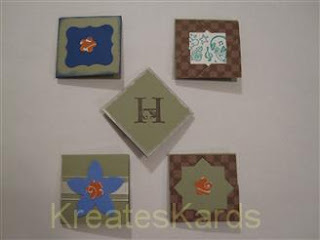 You could personalize with a name or an initial, even a photo if you would like. I thought these would be wonderful holiday presents or stocking stuffers. If you needed a gift for co-workers, these would be perfect as you could personalize them for each person. They wouldn't take up a lot of room either on their desk. Don't we all just love a GREAT sale!!!! Stampin' Up! has created a new section on our on-line ordering site, it is called "Clearance Rack". It has discounts up to 80% off. Items are retired or discontinued so are sold on a first come, first serve basis. It is worthwhile to check often as new items can be added by Stampin' Up! at any time. Here's the link to my Stampin' Up! website. Click on Shop Now, then when the new window opens click on Clearance Rack on the left side. Right now there are 3 pages of items on the Clearance Rack (paper, ribbon, felt flurries, rub-ons, chip board, blank cards with envelopes, plus two kinds of metal tins). Please stop by and take a look. The savings are HUGE!!!! Let me know if you have any questions, I'm just an e-mail or a phone call away. Seems to be an animal theme today (cat and bird) and yesterday (dog). Having lots of fun creating these cards. Hope they help to inspire you too. All Stampin' Up! 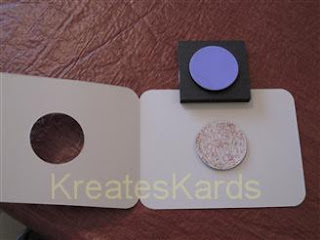 products used to create these cards. This cards was created using the Bride Specialty Paper using the Brayer to color it. I used Really Rust and Chocolate Chip Classic Ink. To put the ink on, I used rubber stamps, sponge, and a brayer. 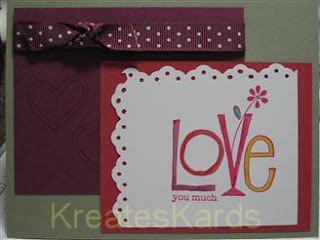 To accent the card, I used Chocolate Chip 1/4" grosgrain ribbon, and to add height to the sentiment I used dimensionals. I used Mellow Moss and Whisper White cardstock. The Whisper White scallop circle (punch) and the Mellow Moss card were highlighted with Really Rust Classic ink using a sponge. 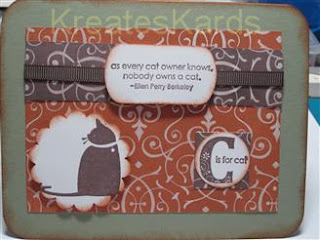 "C is for Cat" stamp set was used for this card (item #115764). Isn't this stamp set great! It is called "Wings of Friendship" (item #114308) and is a Hostess Level 2 stamp set. The bird, branch, and flowers are all one large stamp. I used Stampin' Markers to color in the stamp. Colors used: Garden Green, Ballet Blue, and Regal Rose. I used the Oval Scallop Paper Punch for the sentiment and stamp the accent swirls with Regal Rose for a tone on tone effect. 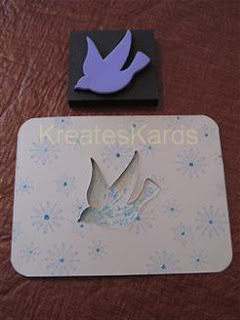 The sentiment is upraised using Dimensionals and the Whisper White piece for the bird has the corners punched with the Ticket Corner Paper Punch. 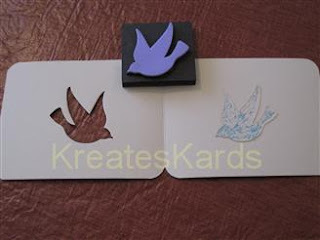 The accent sheet behind the bird is Ballet Blue cardstock. If you have any questions about these products, please let me know. They can be purchased directly through me or through my Stampin' Up! website. 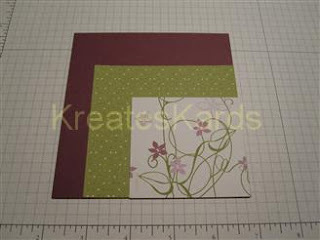 This is a layered card using 4 main colors: Mellow Moss, Rich Razzleberry, Dusty Durango, and Whisper White Card Stock. I used the new IN COLOR Stampin' Markers to color in the LOVE and the Eyelet Border Punch to accent the Whisper White Card Stock. Ribbon is Rich Razzleberry 1/2" Polka-Dot Grograin Ribbon. Snail Adhesive to attach pieces together. Isn't this a great card to send to you that special person to let them know you love them. The card is a mix of Sahara Sand, Whisper White, and the Bride Specialty Paper. I accented the Sahara Sand and Whisper White Card Stock with the Platinum Shimmer Paint. The shimmer paint was added using a dauber. I used a brayer to color the Bride Specialty Paper with Taken With Teal Classic Ink. D is For Dog Stamp Set (item #115784). Thought this is a perfect card for someone who loves dogs, don't you! Also like this card because it wasn't too frilly, so could be given to a man or woman easily. My challenge to you is to make a card to "share some love". Feel free to post and let me know what you created. Would love to see your creations too. Stampin' Up! has the most beautiful Specialty Paper. It is very elegant in "foiled" Whisper White (Bride), Basic Black (Groom) and Very Vanilla (Bridesmaid). 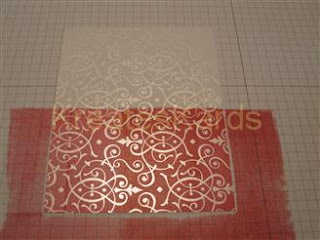 The foil gives the paper shine, pattern, and texture. Each package is 10 sheets (5 sheets each of 2 designs) and paper is 12" x 12". The back of the sheets are solid color that match the front color (Whisper White, Basic Black, and Very Vanilla). My niece, Lauren, is getting married in just a couple of weeks. So lots of focus for our family on the wedding right now. So when I saw this brayer technique for the Bride Specialty Paper, I knew I had to try it. Thank you Patty's Stamping Spot for the heads up on this technique. Above is one of the two cards I made using this technique. Definitely now want to get Melon Mambo polka ribbon too. I do like it with the Rich Razzleberry ribbon, think it gives a nice contrast on the card. When you purchase the Bride Speciality Paper (also the Groom and Bridesmaid papers) it is a package of 12" x 12" paper, 10 sheets with 2 designs of 5 sheets each. 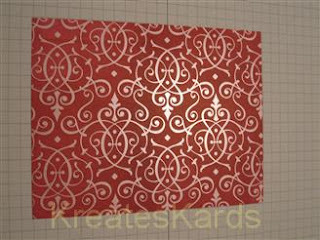 One design is above, I call it Filigree. See how shiny the design is. It really looks very elegant. This is the other design in the package. It is stripes. The foil gives it shine and texture. Let's get started. You'll need 1 piece of Bride Speciality Paper (I'm doing a card front, so piece is 4 1/4" x 5 1/2", a brayer, and Melon Mambo Classic Ink. I always work with a piece of grid paper under my project. Helps protect the work area from glue, ink, and markers. Ink your brayer going in one direction. Once it is well inked, start on the grid paper and roll over your Bride Specialty Paper. Cover complete piece of paper, going in many different directions to help eliminate brayer lines. The shine shows thru even after adding in the color. 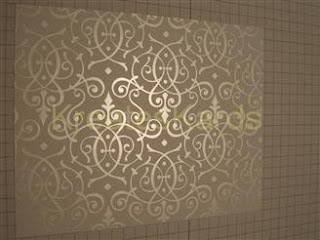 Brayered filigree piece shown above. 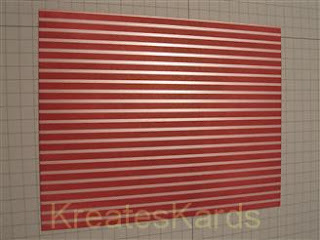 Brayered striped piece shown above. This photo is to show the comparison of the paper before and after using the brayer and ink. I liked it so much decided to use it on the cards I was making. I used approximately 5 1/4" of ribbon to wrap the ribbon around the white piece of paper, attaching the ends on the back with tape. Then I took approximately 3 inches of ribbon and made a knot around the strip of ribbon. You have to manipulate the bow/knot if you want the polka dots to show. This ribbon is solid on one side and polka dots on the other. 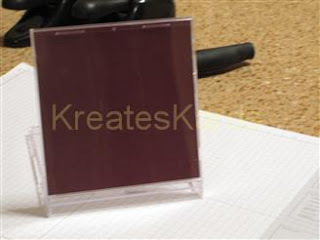 Using sticky strip, attach the white specialty paper and ribbon to the left side of the card front. 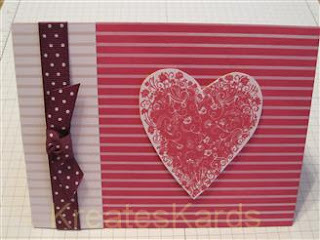 I stamped the heart on Whisper White Card Stock using Melon Mambo Classic Ink. 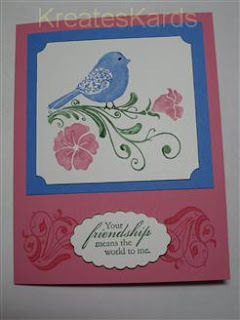 It was attached to the card front with Stampin' Dimensionals to give it height and dimension. 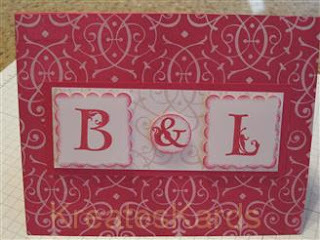 Here's the 2nd card I made using the Groom's & Bride's first initials. If you are doing monogram items, the Lovely Letters Alphabet Stamp Set is a perfect choice. I sponged the edges with Melon Mambo Classic Ink before attaching to the Whisper White Bride piece with dimensionals. Isn't this a great technique !!!! I love the look of the paper and how much more versatile it now is. Imagine all the possibilities with using different colors of ink. I hope you will try it and post photos of what you have done for us to see. Remember, there is still time to order your Halloween stamp sets, embellishments, and Sweet Treat Cups. Contact me or order directly thru my Stampin' Up! website. 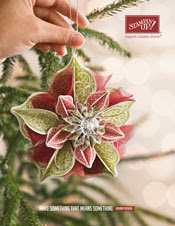 So many wonderful items to chose from in our Idea Book & Catalog 2009-2010 AND the Holiday Mini Catalog. If you haven't received our Holiday Mini Catalog (and don't currently have a Stampin' Up! demonstrator), please contact me via e-mail with your name and mailing address so that I may send you one. Having fun with My Digital Studio from Stampin' Up! 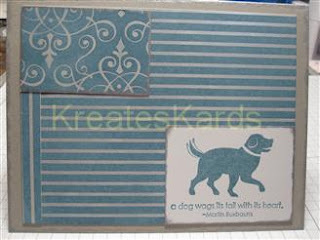 Here are two samples from My Digital Studio ... the one above is a card front (with white background) that was in the file of Designer cards. It is really pretty, but I wanted something different. So I chose a stamp set in the software called Baroque Motifs (you can find it on Pg 131 of the main catalog) and decided to have some fun with it. I added it to the card front a total of 5 times and each time chose either green or red from the original design as the color. 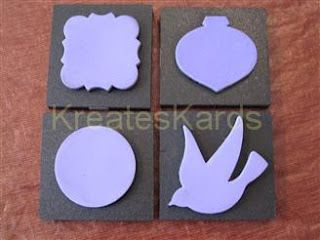 I was able to "grab" the exact color used in the image above for the stamps with a couple of clicks of the mouse. Then I sent the stamped images to the back so that the oringinal images would remain on the top of the design ... giving it a layerd effect. I'm learning more and more each day. I am attending another Webinar on Thursday which will be about making our own calendars using My Digital Studio. 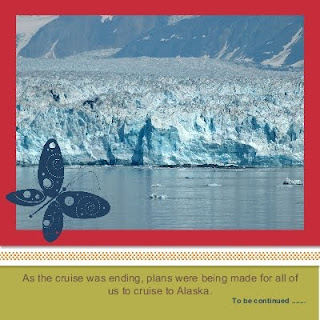 I would like to make a 2010 calendar using many of our photos from Alaska thatwe took while on a cruise in 2006. 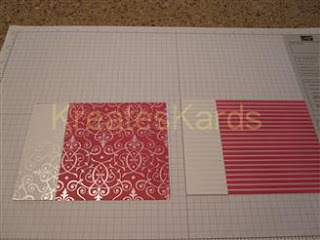 I only worked on the card front, but you can also design an inside top and an inside bottom part for the card. At this time, nothing can be done on the back of the card. It has a standard logo it prints. As of the first of October, Stampin' Up! customers will be able to purchase Stampin' Up! 's latest innovation: My Digital Studio. 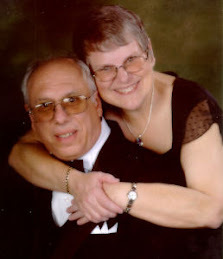 My Digital Studio will make creating cards, photo albums, scrapbooks, and other projects even simpler. It uses the same artwork, colors, and accessory images that are found in our current product line. It will open doors to your creativity. We even offer professional print services or you can print at home. Your projects can now be 100% digital or a mix of digital and traditional. 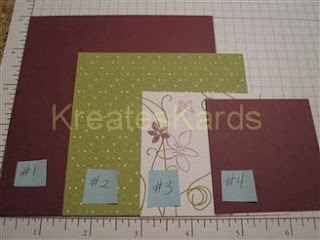 Print out your pages individually then embellish at home with ribbons, brads, etc. or have your complete project printed and bound in a beautiful book format. You can even use this product as a designer ... by designing on the computer first you will be able to see your project before using your paper and embellishments. Isn't this great!!! No more wondering if something will work or wondering how it will look. You will know immediately by creating it on the computer first. As a demonstrator for Stampin' Up!, I was able to pre-order my copy of My Digital Studio this month. I have been busy taking classes, learning as much as I can to use the program. Last night I finished my first album and sent it off to the printer thru Stampin' Up! I chose a leather cover, book bound style for my album. It was so easy to add in photos, change papers, and add in embellishments and text. There are even templates to use or you can create your project 100% from scratch. Up to you. 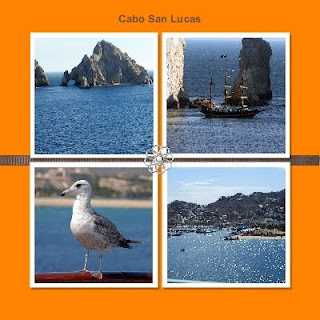 Cabo San Lucas is such a beautiful area. We docked out in the harbor, and if you want to go ashore you have to take a tender (small boat) in. Sitting on our balcony we could see the beautiful rock formation that it is known for, a pirate ship, seagulls, and beautiful views. We had our first ever AFT balcony cabin which meant we were on the very back of the ship. We could watch the wake of the ship. What wonderful views too. 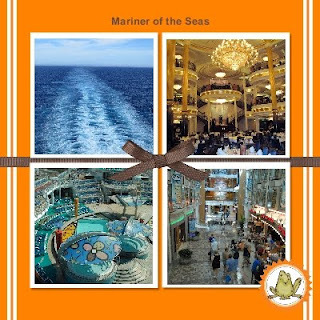 We cruised on the Mariner of the Seas, and the ship is immense !!!! The week of cruising went by so quickly. It was wonderful to spend time with friends and just relax. By the end of the cruise, we were already planning our next cruise with our friends. The next one will be to Alaska on the Carnival Spirit. Wouldn't this make a wonderful Christmas or Hanukkah present !! The release is perfect timing for holiday gift giving. It will work both on PCs and MACs. There are over 2,000 images (papers, punches, embellishments, and stamp sets) that come with the software program. If you have any questions about Stampin' Up! or My Digital Studio, please contact me. Are you looking for a product that will all you to cut a card and a design all at the same time??? Stampin' Up! has just what you are looking for. 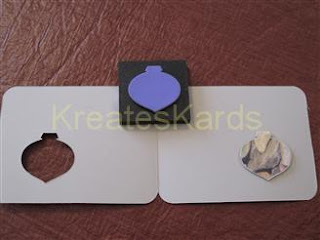 The Mover & Shaper (item 114506) has the base with magnetic window to cut our your card from 6 x 12 card stock, placing a crease/fold, and also cutting out your chosen design window. 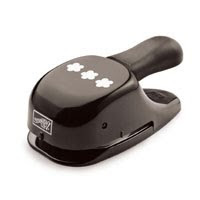 The windows are magnetic, so can be placed any where on the magnetic surface of the Mover & Shaper die. This die is a BigZ XL so does require use of the extended cutting pads PLUS the extended premium crease pad. 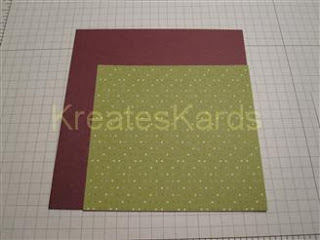 This BigZ XL die and windows are used with the Stampin' Up! Big Shot die cutting machine (item #113439). 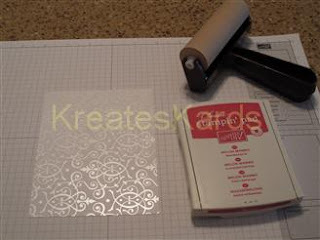 The Curly Label, Punch Windows, Ornament, and Circle cut outs are just a bit larger than our paper punch images so the windows can be easily used as a shadow piece behind a paper punched image. Really great for layering. This is the Stampin' Up! Holiday Window set. Bird Window. I used snail adhesive to attach the bird to the card. Isn't it great how the two images face each other when the card is open. The front of the card has been stamped with snowflakes using the Level 2 Hostess Gift Set called "Christmas Punch (item #115366). Thought this was a good mix with Circle Circus Stamp Set (item #115778). 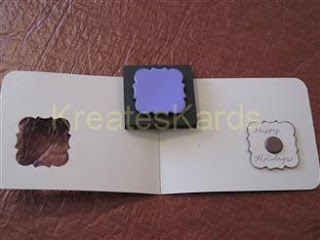 Adhered to the inside of the card using Dimensionals (item #104430). Card accented with glitter glue. I used the Photo Frame Paper Punch (item #109042) to create the tree on the front of the card, then accented with glitter glue. Used a Chocolate Chip Jumbo Brad (#112533). 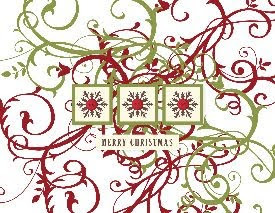 Adhered to the inside of the card using Dimensionals (item #104430). The photo frame paper punch is one of my favorites. There is so much that can be done with it and is also perfect as a frame corner. 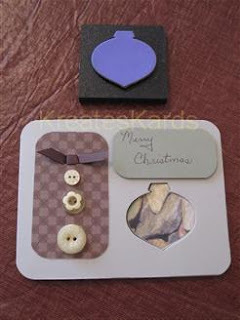 The final card was made using the ornament window. 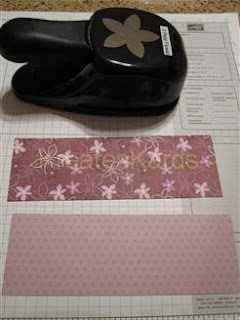 I then cut out some patterned patter with the ornament paper punch. The ornament window is just a tad bigger than the punched out image. 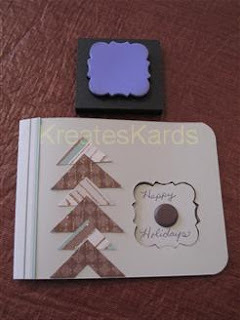 Accented the card with ribbon, buttons, and DSP (desinger series paper) all from Stampin' Up!. All cards were made using Stampin' Up! 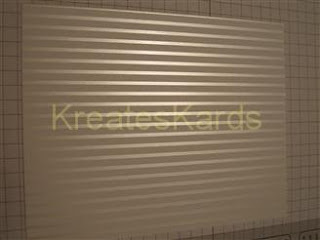 Sahara Sand 12 x 12 card stock. 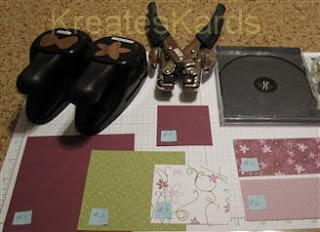 I really found the Movers & Shapers system to be easy to use and so creative. I LOVE the versatility with all the choices and how so many will shadow/layer with our paper punches too.